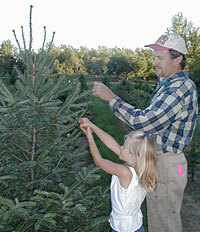 We look forward to the tree "chopping" season and seeing Choose and Cut customers at the farm in Newburgh. Freshly harvested trees will be on display for your choosing. Our wreath room's displays of evergreen and dried flower creations show off nature's finest holiday smells and sights. We're keeping the cider warm for you. May your Christmas holidays be the most special. All the best to you and yours from the "Nuts" at Nutkin Knoll Farm.